An informative and unique website creates an active web-browsing experience for a dynamic company. 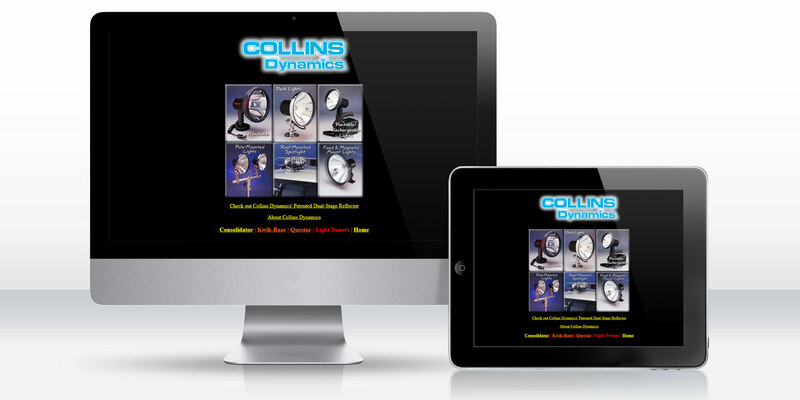 Collins Dynamics manufactures a variety of performance lighting products and communication equipment. Their equipment can turn vehicles into high-performance command centers or efficient emergency vehicles. In 1997, Collins Dynamics wanted to expand their marketing reach by establishing an online presence. The site needed to be as dynamic as the company and shine a light on all the products and services they provide. As a custom website design and development company, Dynamic Digital Advertising (DDA) knows what it takes to create dynamic websites. The professional graphic designers on staff would create an attractive and user-friendly site design that would complement certain enhancements to make the site unique. DDA programmers would ensure these enhancements would function properly throughout the site, making the Collins Dynamics website one-of-a-kind. When you first land on Collins Dynamics website’s homepage, you will notice the clean design and navigation system. However, when you rollover one of the lighting product images, you’ll find this site has more than meets the eye. Each featured light has a unique rollover state that really lights up the page. The lighted lamp effect was created using photo manipulation and programming to showcase each product. Clicking on these homepage images will take you to an individual page to learn more about the product. These product pages were designed to clearly compare products and inform visitors of product features and benefits. In addition to lighting products, Collins Dynamics offers a full range of communications equipment, including a console and mobile data mount that can come off-the-shelf or be custom made to fit any need. This Consolidator product has its own section of the website, which includes a 360-degree spinning logo that DDA developed. Filled with information and unique characteristics, DDA provided Collins Dynamics with a website that not only informs visitors of the essential products available, but creates a memorable browsing experience.